Best Tequila For Sipping? | What's Best Audio and Video Forum. The Best High End Audio Forum on the planet! I've just become curious so I've done some reading. Names that pop up often on best of lists are Don Juliio, Casa Noble, Herradura, Tesoro. Aficionados seem to frown on Patron. What thinks ye? Any tequila connoisseurs out there? For better or worse , I'm a huge tequila fan w/about 20 bottles or so. First off, make sure it's 100% agave -- everything you list is. If it doesn't say so on the label, it isn't real tequila as a cheaper sugar source is used for fermentation in addition to the agave. If you look at a standard Cuervo label, it won't say 100% agave. Second thing is to try the three types: Blanco, Reposado, and Anejo. It's a completely mistaken notion to think that more aging means better. Blanco is unaged and gives you the straightest agave plant flavor, which ranges from peppery/spicy to fruity. Reposado is aged less than a year, typically in oak casks. You get some mellowness and wood flavor, and pick up some yellow/gold color as well. Anejo is aged over a year -- it's the most woody tasting, scotch-like really, and is the least agave forward. Gold to brown in color. I love the agave flavor and don't like scotch, so I stick to blancos and reposados. Some favorites include 4 Copas blanco -- organic and toward the spicy side. Cabo Wabo blanco -- toward fruity. Chinaco reposado -- somewhere in the middle. Casa Noble reposado -- very complex. Dos Abuelos blanco (bought in Mex., don't know if it's avail here) - balanced. Clase Azul reposado -- aged in sherry casks which gives a slight sweetness to the imparted woodiness -- amazing, unique, expensive here. All of the above are very smooth. There are obviously a ton of other good brands including Herradura and Partida. Patron is fine if perhaps less complex than some other blancos. The king of the hill always takes some knocks. Their Citronage orange liquor is absolutely the best orange spirit out there, spectacular for margaritas.f A knock on Patron and some other of the big lot manufacturers is that they use machine presses on the agave for some of their tequila to make the pulp, then rinse of the remaining pulp on the machines into the mix, thus watering down the agave a bit. Dos Abuelos, for example, does it the old way -- stone paddles mash the agave, no water added -- but their output is probably 1/1000 of patron. For better or worse , I'm a huge tequila fan w/about 20 bottles or so. I love the agave flavor and don't like scotch, so I stick to blancos and reposados. Interesting observation. You might be on to something here. I love scotch and my favorite tequilas are anejos. Some favorites include 4 Copas blanco -- organic and toward the spicy side. Cabo Wabo blanco -- toward fruity. Chinaco reposado -- somewhere in the middle. Casa Noble reposado -- very complex. Dos Abuelos blanco (bought in Mex., don't know if it's avail here) - balanced. Clase Azul reposado -- aged in sherry casks which gives a slight sweetness to the imparted woodiness -- amazing, unique, expensive here. All of the above are very smooth. There are obviously a ton of other good brands including Herradura and Partida. I drank Herradura Anejo for years but in the last few years have branched out. The 4 Copas Anejo is absolutely delicious. I have a bottle of the Casa Noble Anejo that I'm about half-way through; it is good but no match for the 4 Copas. Interesting you mention the Clase Azul. I have a bottle - is that the right word for the porcelain container in which it comes? - of the reposado that I'm about 80% through and it is one of my favorites. I'm anxious to try the Clase Azul anejo. Patron is fine if perhaps less complex than some other blancos. It burns clean but is easily (IMO) surpassed by other blancos. Actually, I'm amazed Patron blanco is sold as much as it is. Great marketing, I suspect. Obviously, just like beer, wine, art, etc., everyone's tastes are different. Its just that mine are right. Yeah , Patron was the first and best w/'premium' tequila marketing. As I said, I think it's fine, but it's never my choice. If you like the reposado, I'm sure you'll love the Clase Azul anejo. Kinda caramel-y if I remember correctly. I wonder if I can extrapolate anything from my wine habits. The trend in wine is more and more French Oak in order to satisfy "international" tastes. French Oak can add a nice taste, but unless it's a wine built for long aging and you've aged it a long time, the oak can and often does cover the unique taste of the fruit resulting in wines that taste similar no matter where they are made. So, I am a little tired of the taste of French Oak in wine and look for wine that isn't heavily oaked. This makes me suspicious of anejos and extra anejos. Is there a similar issue in tequila? Just reading around, I see French Oak aging touted quite often. I'm partial to Don Julio, myself. 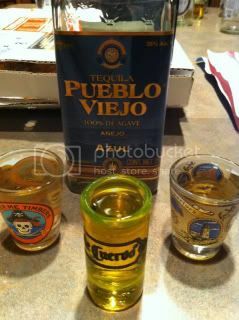 However, last weekend I had some Pueblo Viejo. A buddy brought it back from Mexico. Not sure if you can buy it here or not. But damn! It is some smooth tequila. I am not a big Tequila fan (prefer Mezcal instead) but lean towards white ones rather than reposado or añejos. I like Purasangre too. Am going to Mexico in Nov. and will be leaving room in the suitcase for a haul. Any Mezcal recs? Mezcal has similar presentations than Tequila, there are Blanco, Añejo, etc... Unfortunatly the best Mezcal is produced on very limited quantities in Oaxaca state made by- hand from small boutiques or local producers. Saying that, there are two that could be found in local stores, Mezcal Semillero and Mezcal Oro de Oaxaca. One last word... Avoid asking for the worm inside of the bottle, very few Mezcales have it and is not in any way an indication of fine Mezcal, just the opposite. I'm not much of a worm guy, so that's easy. Would love to go to some of those small boutiques, but unfortunately won't be in Oaxaca. For those of you in California, Los Abuelos tequila is now available in-state under the 'Fortaleza' name. Love the blanco and reposado, Los Abuelos is my favorite tequila line of the moment and formerly only avail. in Mexico. It's on the rustic side, very earthy. Not the ultimate in smoothness, but that usually comes from too much distillation for which there is a loss-of-flavor-and-character penalty. Are you stopping by Mexico City rblnr? Not this time, was just on the coast around Akumal/Playa Del Carmen. Nice place! Hope you had fun and a relaxed time there! Y wife and kids in Akumal, really pleasant little village. Was a kick to see my 5 and 7 yo girls when they saw sea turtles in the water. I haven't had any hard liquor in over 25 years...it just doesn't agree with me. The culprit for my quitting the hard stuff was Scotch as I didn't like myself too much after the fact. The one drink however that I couldn't deal with at all was Tequila. The smell of it made me instantaneously naucious and one single sip made me heave. I've only ever had a sip twice (yes I tried it again) in my life and I will never have anything to do with it again. A beer or a glass of wine is fine, so I stick with that. My wife and I stayed in a beach house we rented in Acumal several years ago. Did you go to the fresh water lagoon on the very north side of the village? We loved it there, fun place to just walk around. We saw some very large iguana's pretty much every time we went for a walk. Funky little bar right on the beach that had some tree houses you could climb up into and lower a big bucket on a rope to bring your drink orders up in. Real interesting trip down the ladder after an evening of indulging in margarita's! Got to see a few sea turtles out in the bay and a lot of nests on the beach. Sounds like a lot of fun. I dove and we all snorkeled in the ocean, not in the lagoon. Ate at a nice little tavern across from the dive shop and took a walk around the village. Our hotel was in Playa Del Carmen which is all built up now. Twenty years ago I stayed there in a hut on the beach for $6 a night.